Wedding Cakes from Scandinavia – The Scandinavian countries have some absolutely lovely wedding traditions and they also have some interesting traditions when it comes to their wedding cakes. These cakes all make those dry fruit cakes covered in soap-masquerading-as-icing seem like a silly idea. Why choose fruitcake when you can have something more fun, and meaningful, instead? You can’t tell me that berries, almonds, cream, chocolate and butter cream icing don’t sound far more appealing! Norwegians shy away from cake and opt for a bread-based dessert. The traditional bradlaupskling is a type of bread served with a topping of cream, cheese and syrup. It is folded over and served to the guests in small squares. This tradition came about in the days when white flour was a scarce commodity and bread was considered a luxury. 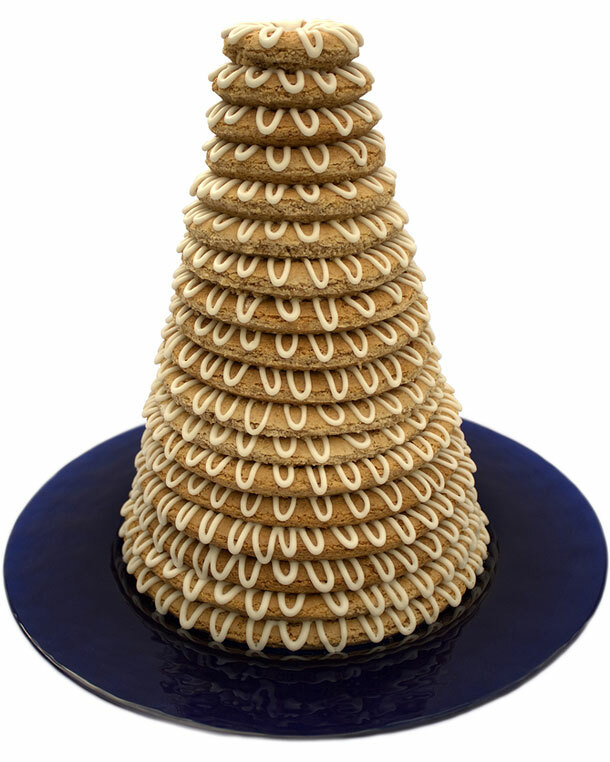 The cake served at weddings in Iceland is called a Kransekake and it is a cake made of marzipan rings stacked on top of each other in a cone shape to signify abundance. These cakes are decorated with candy and flowers and are filled with chocolates. The traditional Danish wedding cake is called a cornucopia cake and is also a ring pyramid cake made of pastry, marzipan and almonds. The outside is decorated with sugar work while the inside is filled with chocolate, candies and almond cakes. The newlyweds must cut the cake at the reception and all of the wedding guests must eat a piece in order to avoid bad luck. Swedes place more importance in the taste of a cake than in how it looks. Chocolate cakes with proper butter icing are most popular and the cakes are decorated very simplistically, usually with flowers that match the bride’s bouquet. In Finland cakes are not decorated with icing sugar as this is considered to be too sweet. Cakes are rather decorated with fresh whipped cream and berries, and it would probably not go down very well if the bride and groom were to smash the cake in each other’s faces. What Is Your Wedding Cake Flavour?